It is essential to keep an eye on your Office 365 security and various permission. There should be a clear view of who can access what information in your organization. But Microsoft fails to provide the high-level view of all the administrator and their permissions in your organization resources. Admindroid Office 365 reporter helps you to analyze various security related information like administrative users & their roles, user with a weak password and user’s password policy. You don’t need to use PowerShell commands like Get-MsolRole, Get-MsolRoleMember, Get-MsolUser or Get-AzureADServicePrincipal to retrieve this security info. AdminDroid gives all the high-level insights about your security and detailed reports on those insights in a single click. 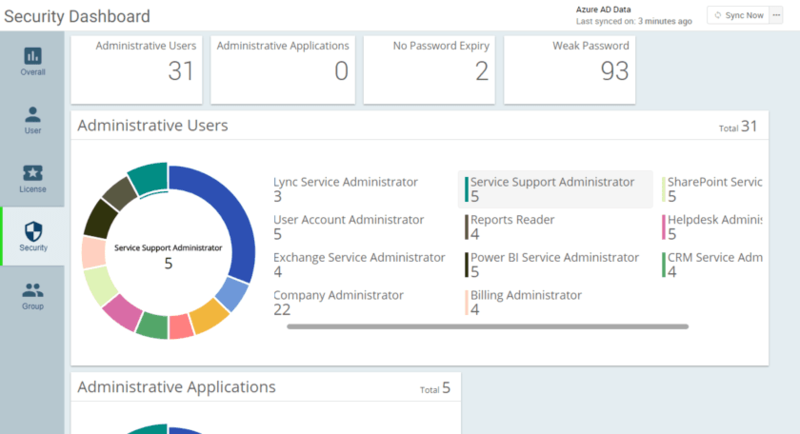 Following are some of the insights shown in security analytics dashboard. Get to know how many administrators are in your organization. Get to know how many administrator are assigned for each role. Get to know how many numbers of administrative applications are installed in your organization. Get to know how many 3rd party application added by your users. Get to know how many user accounts are allowed to set a weak password. Get to know how many users don’t require periodic password expiry. Following are the Group reports offered by AdminDroid Office 365 Reporter. You can schedule one or more reports to run automatically at configured time and delivered straight to your preferred mail-ids. You can export the report results to CSV, Excel (XLS/ XLSX), HTML or PDF. This report provides all the users who are allowed to set a weak password. This report helps you to review those user's password policy and reduce the risk of those accounts being hacked. This report provides all the users whose password expiry is disabled. This report helps you to review the password policy of user accounts. This report gives you the list of administrative users in your organization along with the allocated roles. 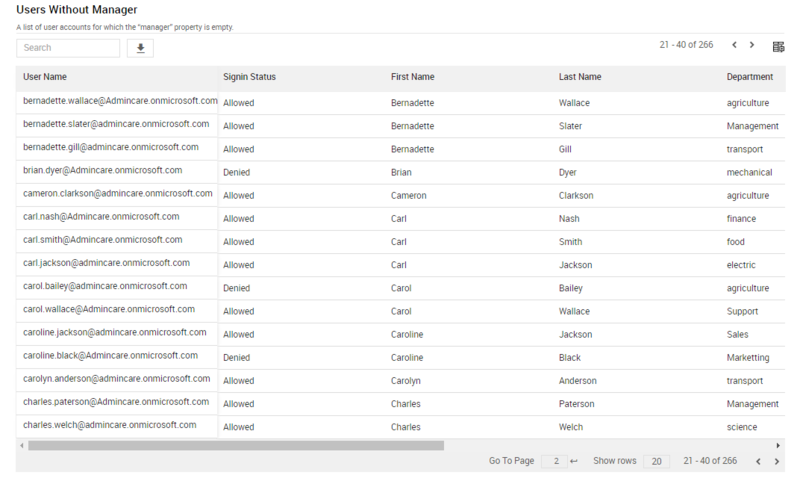 It helps you to ensure that correct users have required role permissions. Freshly baked insightful dashboards and reports on Secure Score, MFA, License, and Passwords on AdminDroid. AdminDroid Office 365 Reporter Integrates Office 365 Secure Score to Make it More Accessible and Powerful. Admindroid Now Helps Organizations to Improve IT Productivity and Reduce IT Spending. AdminDroid now helps you to easily audit your Power BI Workspaces.